The Vitamix 5300 is a high-end blender that is capable of a wide variety of functions. Though it doesn't provide a lot of fancy settings, the ones it offers are very capable and the device itself is well-built. The vast majority of customers find this to be a highly useful tool, making it well worth the cost. You can also use it for many different foods, making it an extremely versatile option. Related: Check out our reviews outlining the blenders which are the best for ice. Offers fewer features than other models, but features are highly effective. Versatile speed; may be lacking some bells and whistles. Buttons are clear and easy to use, highly versatile. Typically great for everyday use, but breakages can occur. There are a multitude of enjoyable features that come with the Vitamix 5300, from pulsing to speed controls and more. It also uses blades that are made from stainless steel, allowing them to be very reliable and durable. There's no doubt that these blades can cut through just about anything. The included pulse feature makes it a great option for those who want full control over the blending process. You'll be able to touch a button to start the machine, allowing you to get things blended to exactly the degree you want them, without worry of them becoming overly slushy. On top of that, you'll have more control over the speed than you might with lower-end models. Many of those options only allow for one speed, but this one includes a dial which can be set to the exact speed you require for any food, which is highly useful. One of the greatest features included with this model is that it's capable of cleaning itself. All you have to do is add some warm water and a small amount of dish soap, and the blender will be clean in up to a minute. That can relieve a lot of the headache that comes with many blenders. This is one of the more expensive options out there, so it's going to be for those who are really serious about what it has to offer. If you're someone who gets intense in the kitchen and enjoys cooking just about everything from scratch, it's a perfect product. 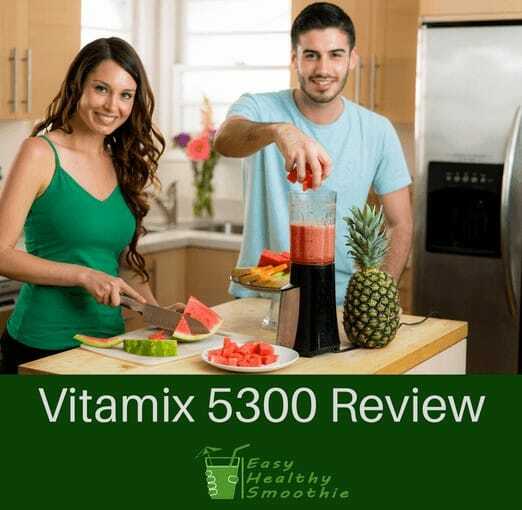 Because it's able to make smoothies, nut butters, soups, frozen desserts and even your own homemade baby food, the Vitamix 5300 is also a great choice for those who want to save money over buying pre-made versions of those foods. There's little you won't be able to make using this device. It does require quite the investment, but with that comes a high level of durability. You'll be able to emulsify, heat, blend, chop and grind everything you need to, meaning it can do the job of several machines in one convenient device. Largely, the Vitamix 5300 blender is what comes in the package, with all the abilities it offers. It includes the container, base, lid, and blades as well as an attached cord to plug it in. Overall, it's a simple package with a simple, but highly powerful blender. On top of that, you'll get a fantastic 5-year warranty that can keep you covered during any issues that may pop up during normal use. In addition, that also means that the machine itself is certainly going to last for at least 5 years, unless it's broken in a way that voids that warranty. One of the great aspects about the Vitamix 5300 is the stainless steel blades, which are very sharp and highly durable. Consequently, they're going to be able to take just about anything you can throw at them. However, you might want to research the potential for replacement or sharpening if they should grow dull. In addition, the size of the blender is quite large, with its ability to hold 64 ounces at a time. This is fantastic for those who want to make large quantities of things, but some customers have found that it can make blending small amounts more difficult. Furthermore, the motor is designed to run without building up too much heat, but there can be some issues with overheating that customers have found. As a result, it's a good idea to try not to overwork the blender in one go and keep an eye out if it seems to be getting warm. Overall, this is a device with a lot of reliability. Based on the reviews left by many customers, it's an absolute powerhouse that is able to handle a wide range of different foods. You can make so many things in it, that it's sure to become your best kitchen friend. Keep in mind that this is one of the more expensive options, so it's going to come with a lot of quality to back that up. It's unlikely you'll regret finding a place in your budget for this handy blender. You're sure to get a lot of use from it. Fun facts: Who invented the blender?